Hyponatremia is a commonly encountered serious medical condition found both in the general population and in hospitalized patients. Hyponatremia in the setting of acute urinary retention has been described infrequently. We report two patients who presented with severe hyponatremia secondary to urinary retention. Hyponatremia improved rapidly with emptying of the bladder and relief of urinary retention. A 63-year-old male patient came with complaints of inability to void urine for the last five days. His attendants reported altered behavior with irrelevant talk since the previous day. There was no history of burning micturition, breathlessness, ankle swelling, or fever. He had been suffering from urinary hesitancy, urgency, poor stream, and sensation of incomplete bladder emptying for sometime and for which he had not sought any medical attention. He was a known diabetic and hypertensive on irregular treatment. He was a chronic smoker for the last 40 years and used to consume alcohol once a week. On examination, he was conscious and disoriented to time, place, and person. He was febrile, tachycardic (pulse rate of 100/min) with a blood pressure (BP) of 90/60 mm Hg. Abdominal examination revealed a urinary bladder distended up to the umbilicus. There were no signs of cardiac failure or fluid overload. No focal neurological deficits were found. Tendon reflexes were elicited well. Plantars were flexor bilaterally. ECG showed sinus tachycardia. In view of acute urinary retention, he underwent urinary catheterization, following which around 1700 mL of urine was drained. Because of altered sensorium, he was admitted to Intensive Care Unit and evaluated further. Initial investigations showed Hb 11.4 g/dL, total leukocytes count (TLC) 27,800/mm3, neutrophils 94%, PC 277,000, erythrocyte sedimentation rate 17 mm/h, random blood sugar 249 mg/dL, blood urea nitrogen 166 mg/dL, serum creatinine 4.6 mg/dL, Na+ 106 mEq/L, K+ 5.7 mEq/L, Cl 75 mEq/L, total protein 5.6 g/dL, albumin 1.8 g/dL, total bilirubin 1.6 mg/dL, direct 1.1 mg/dL, serum glutamic oxaloacetic transaminase 44 IU, serum glutamic-pyruvic transaminase 43 IU/L, alkaline phosphatase 206 IU/L, gammaglutamyltransferase 29, urine analysis revealed occasional pus cell and no bacteria on urine microscopy. Arterial blood gas (ABG) showed high anion gap metabolic acidosis. Delta anion gap and delta bicarbonate values were almost equal. Hence, acidosis could be accounted for by renal failure. Chest X-ray showed normal lung fields. Ultrasonography abdomen showed prostatic hyperplasia (72 g). Kidneys sizes were normal with no obstructive features. Work up of hyponatremia was done. Clinically, he looked euvolemic. Plasma osmolality was low (259 mOsm/L). Urine osmolality was 144 mOsm/L. Urine spot sodium was 25 mEq/L. The possibility of syndrome of inappropriate antidiuretic hormone secretion (SIADH) was considered. He was not on diuretic or any other drug. His serum thyroid-stimulating hormone and random serum cortisol was within normal limits. He was evaluated for the routine causes of SIADH. Chest X-ray did not show any opacity or pneumonia. No source of infection was identified. There was no recent surgical history and no evidence of head injury or malignancy. He received 2 L of isotonic saline over first 2 h initially, and then, a maintenance dose of 150 mL/h commensurate with urine output. His blood pressure improved to 110/80 mm Hg with fluid challenge and was thought to be due to the correction of subclinical hypovolemia. Subsequent laboratory values are shown in [Table 1] and [Figure 1]. 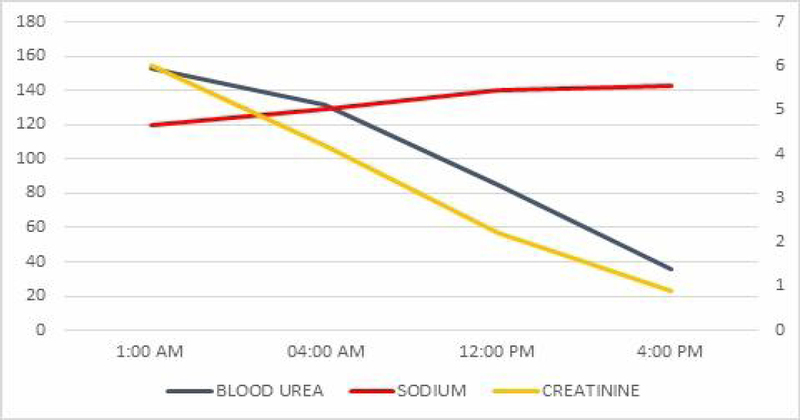 There was gradual decrease in urea and creatinine level and gradual increase in level of serum sodium to normal. No active correction of hyponatremia was done in view of rapid clinical and biochemical response. Table 1: Investigations for patient 1. Figure 1: Graphical representation of values in 1st patient. A 40-year-old woman was admitted with bilateral progressive lower limb weakness over one month previously. On evaluation, she was found to have spinal canal stenosis. She had undergone laminectomy elsewhere following which she had developed paraplegia. She had been however able to void freely at the time of discharge. One week later, she presented with abdominal distension and dribbling of urine. Abdominal examination showed a massively distended bladder. Rest of the systemic examination was normal except for paraplegia. She was euvolemic with pulse rate of 89/min, BP 110/70 mm Hg, and respiratory rate of 18/min. Her investigations revealed Hb 12.3 g/dL, TLC 7000/mm3 with normal differential, BU 156 mg/dL, serum creatinine 4.5 mg/dL, normal liver functions, her serum creatinine was 1.1 mg/dL one month prior had been normal with she had compensated metabolic acidosis on ABG, hyponatremia (Na 120). Urine analysis revealed no protein or blood, white blood cell count of 4–5/HPF, and red blood cell 1–2/HPF. She underwent urinary catheterization following which 4.1 L of urine drained over 4 h. She also received a bolus dose of 1 L of isotonic saline, followed by a maintenance dose of 4–5 mL/kg/h. Without any other aggressive treatment, her biochemical parameters showed improvement with eventual near normalization [Figure 2]. Figure 2: Investigations in 2nd patient. Hyponatremia is primarily a disorder of water balance or water distribution. SIADH is characterized by the activation of water conserving mechanisms despite the absence of osmotic or volume-related stimuli. Because the renal response to volume expansion remains intact, these patients are typically euvolemic. However, because of the rise in total body water, serum concentrations of Na are decreased. In elderly patients, hyponatremia is often idiopathic. Aging itself may be a risk factor for SIADH. SIADH often runs a benign course in the elderly and has little clinical significance. However, the elderly may be at increased risk of developing symptomatic hyponatremia with intercurrent illnesses., Another proposed cause though controversial is an enhanced vasopressin response to hyperosmolarity that may occur with increasing age. Correction of hyponatremia by bladder catheterization is considered in patients with psychogenic polydipsia and functional obstructive uropathy. Hence, in our cases, association of bladder distention and hyponatremia was considered. Hyponatremia was corrected rapidly subsequent to urinary catheterization. The probable mechanism postulated for hyponatremia is that bladder distention can trigger release of vasopressin from pituitary either by itself or as a response to pain. This was supported by a study by Galperin et al suggesting urinary retention alone as a cause of hyponatremia. SIADH is the most common cause of hyponatremia in the elderly. However, role of bladder distension and release of vasopressin as a possible cause of hyponatremia should be considered in appropriate cases. Guzzini F, Casartelli M, Cattaneo S, et al. Severe idiopathic hyponatremia caused by ADH inappropriate secretion in the elderly. Recenti Prog Med 2002;93:370-2. Hirshberg B, Ben-Yehuda A. The syndrome of inappropriate antidiuretic hormone secretion in the elderly. Am J Med 1997;103:270-3. Anpalahan M. Chronic idiopathic hyponatremia in older people due to syndrome of inappropriate antidiuretic hormone secretion (SIADH) possibly related to aging. J Am Geriatr Soc 2001;49:788-92. Al-Salman J, Kemp D, Randall D. Hyponatremia. West J Med 2002;176:173-6. Moskowitz DW. Functional obstructive uropathy: A significant factor in the hyponatremia of psychogenic polydipsia? J Urol 1992;147:1611-3. Galperin I, Friedmann R, Feldman H, Sonnenblick M. Urinary retention: A cause of hyponatremia? Gerontology 2007;53:121-4.